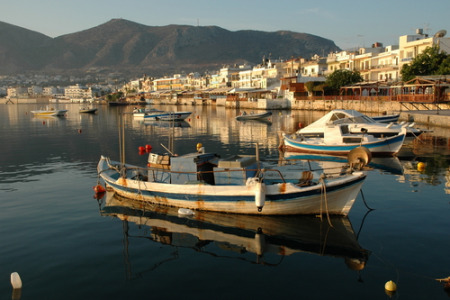 Hersonissos is located on the northern coast of Crete, less than thirty kilometres from the airport. It is a modern tourist centre offering a wide range of facilities. Hersonissos holidays are renowned for their vibrant nightlife with numerous bars, discos and clubs. Holidays to Hersonissos can be taken from early spring until late Autumn when temperatures range from the early twenties to the mid thirties. We have a number of cheap Hersonissos holidays which may interest those seeking respite from inclement weather. With sandy beaches washed by safe clear waters and a variety of water sports, as well as land based activities, our low cost Hersonissos holidays attract thousands of visitors every year. Although holidays in Hersonissos may be lacking in traditional Greek flavour, they more than compensates with excellent facilities which ensure a memorable stay. With good accommodation, numerous restaurants and tavernas catering for all tastes, shops for all essentials, and bars and discos galore, our Hersonissos holiday deals disappear like hot cake. To avoid disappointment and for further information on our latest Hersonissos holiday offers, please use the search facility.